Why is the reported location off? We're often asked why the location being reported seems to be off from where the device current is located. There are many factors that can affect this, but the primary reason is because you are looking at a CELLULAR APPROXIMATION and not a GPS report. A GPS report is accurate up to 15 meters. This is obtained when the device can access satellites via a clear line of sight, almost always outdoors in ok weather. If GPS is not available, a cellular approximation is used. This attempts to find your location based on the closest cell towers. 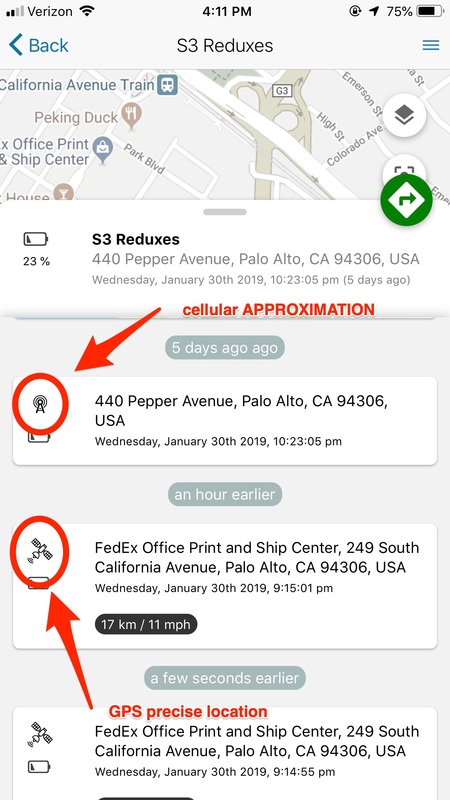 This is only accurate up to 2000 feet, so it's definitely more of an "area" then a "location," but more often than not it's better to have some idea of a device's location than none. You can tell if a location is from GPS or Cell by looking at the icon in the drawer of the map. A little cell tower indicates an approximation, a satellite indicates a more precise location.